On-the-job training (OJT) is a common means of training workers. By definition, it seems relatively simple. However, to be effective, training must go beyond the simple process of following an experienced worker around the workplace - sometimes called the "follow Joe" method. 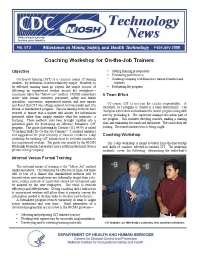 NIOSH researchers spoke with human resources personnel, safety and health specialists, supervisors, experienced miners, and new miners and found that OJT was of high interest, but was rarely part of a formal or standardized program. Various training methods have evolved to ensure that a trainee will absorb the information presented rather than simply emulate what the instructor is teaching. These methods have been brought together into a published guide for developing an effective formalized OJT program. The guide (Information Circular (IC) 9479) is called "Coaching Skills for On-the-Job Trainers." It contains materials and suggestions for your company or mine to conduct a 1-day workshop for teaching OJT trainers how to be better coaches to less experienced workers. The guide was created by the NIOSH Pittsburgh Research Laboratory and a safety professional from a private mining company.